I joined UNL as a research assistant professor in 2006 and led the GIScience program at the National Drought Mitigation Center (NDMC) for six years. I have also been a faculty fellow with the Center for Advanced Land Management Information Technologies (CALMIT). I worked on a range of research projects that analyzed satellite-based Earth observations to incorporate information about vegetation health, soil moisture, and evapotranspiration into drought monitoring, both in the United States and internationally. In March 2012, I became an associate professor in the School of Natural Resources (SNR), where I teach remote sensing courses, maintain my current research program, and expand my remote sensing work through new collaborations within SNR and UNL. In April 2018, I became a full professor in SNR. My selection of a career path in the field of remote sensing stems from interests in agriculture and natural resources that I developed growing up in small-town Nebraska, and during my academic training in environmental geography and GIScience. The remote sensing perspective from satellites and aircraft offers a unique vantage point to study key ecological and environmental patterns and processes across the landscape. As a result, my primary research focus has been to apply remote sensing as a tool to acquire critical information needed to better understand and address agricultural, environmental, and natural resource issues. drought monitoring and early warning. I have been involved in a number of remote sensing projects that investigate how new types of satellite observations and innovative modeling techniques can improve drought monitoring systems. My research has been funded by various federal agencies including the National Oceanic and Atmospheric Administration (NOAA), NASA, the U.S. Department of Agriculture (USDA), and the U.S. Geological Survey (USGS). 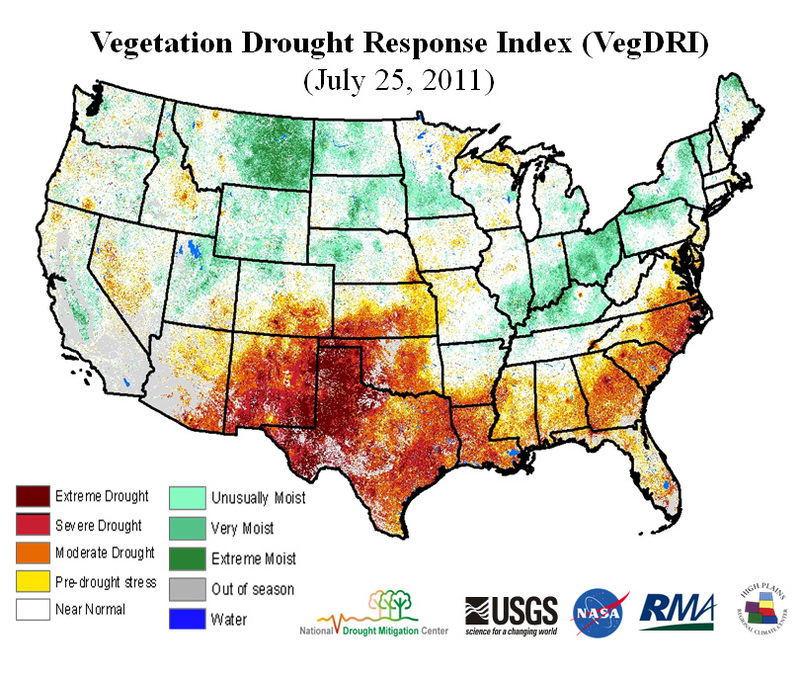 A prime example is the development of the Vegetation Drought Response Index, or VegDRI, online at http://vegdri.unl.edu/, which integrates satellite, climate, and biophysical data to depict drought-related vegetation stress across the United States. VegDRI map for July 25, 2011 depicting the severe to extreme agricultural drought conditions over the south-central United States. VegDRI is becoming increasingly used by the U.S. Drought Monitor (USDM), National Weather Service, and individual states as part of their operational drought monitoring activities. I have also collaborated with NASA scientists to apply soil moisture and groundwater information from land surface models, which integrate satellite-based gravity information, into the operational USDM. Weekly maps from this project are published on the NDMC's website: http://drought.unl.edu/MonitoringTools/NASAGRACEDataAssimilation.aspx. I am also working with USDA Agricultural Research Service (ARS) scientists to develop remote sensing-based drought indices related to evapotranspiration for drought assessments. These new tools are being increasingly adopted by state-of-the-art drought monitoring systems, such as the USDM, and attempts are underway to extend them to other parts of the world. In addition to monitoring, I have worked with faculty at the University of Wisconsin-Madison and the University of Nevada-Reno to use historical remote sensing observations, climate data, and bird surveys, to better understand the impact of drought and heat waves on avian populations over the United States. This study is one of the few to focus on the ecological impacts of these natural hazards. It provided new insights into both the positive and negative impacts that droughts and heat waves can have on bird population dynamics, which can be used for natural resource and wildlife management. 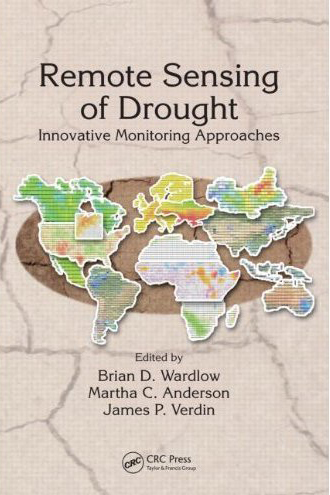 I edited a book, "Remote Sensing of Drought: Innovative Monitoring Approaches," that includes contributions from leading remote sensing scientists around the world. They summarize cutting-edge remote sensing tools that are applicable to drought monitoring, food security and water scarcity. I also provide technical guidance for drought-related topics as a member of the NASA soil moisture active passive (SMAP) applications working group and the Group on Earth Observations (GEO) drought definitions and indices study team. "Remote of Drought: Innovative Monitoring Approaches" was published by CRC Press in April 2012, which summarize new cutting-edge satellite remote sensing techniques throughout the world being applied for drought monitoring and future considerations of such applications. My research associated with characterization of agriculture-related LULC patterns and vegetation dynamics has involved projects such as classification of irrigated cropland, and estimation of crop phenology from both close range and satellite. I had the privilege to host and work with Dr. Toshihiro Sakamoto, a Japanese visiting scientist at SNR from the National Institute for Agro-Environmental Sciences (NIAES). We worked on developing new satellite-based methods to estimate critical crop stage dates for corn and soybeans. These dates can be used to detect inter-annual, local variations in crop phenology across large regions such as the U.S. Corn Belt, to better understand the interplay between climate, phenology, and crop yields. This work was also extended to develop cost-efficient digital camera methods to capture field-level crop phenology information, as well as satellite-based approaches, to estimate gross primary productivity (GPP) on crops in collaboration with Carbon Sequestration Program faculty at UNL. I have also worked with USGS scientists to develop methods to rapidly classify and map irrigated cropland across the United States (http://earlywarning.usgs.gov/Usirrigation/). This improved LULC data helps various water resource management and environmental modeling efforts. A 250-meter crop map derived from multitemporal MODIS vegetation index (VI) data and multispectral 30-meter Landsat imagery over southwest Kansas. Field-level crop patterns and conditions can be mapped and monitoring using time-series MODIS VI data for detect changes in land use/land cover patterns, assess crop conditions, monitor crop phenology, and estimate biophysical characteristics of crops. Outreach and education on the use of remote sensing and GIS for drought-related applications has been a major component of my work over the past six years. I have presented the use of these geospatial technologies to students and scientists from various disciplines - at national conferences and international workshops - in countries such as Argentina, China, Mali and Turkey. In addition, I have been involved in hands-on technical training with scientists from Canada, the Czech Republic and India. I also serve as the co-advisor for the Geography Student Organization (GSO) and Gamma Theta Upsilon (GTU) geographic honor society at UNL. My teaching responsibilities include remote sensing courses offered at UNL such as Introduction to Remote Sensing, Digital Image Analysis, Applications of Remote Sensing in Agriculture and Natural Resources, and special topics. Bijaber, N., El Hadani, Driss, Saidi, M., Svoboda, M., Wardlow, B., Hain, C. R., Poulsen, C. C., Yessef, M., Rochdi, A. (2018). Developing a Remotely Sensed Drought Monitoring Indicator for Morocco. Geosciences, 8(2), 18pp. Cai, Y., Guan, K., Wang, S., Li, Z., C. Seifert, Wardlow, B. (2018). 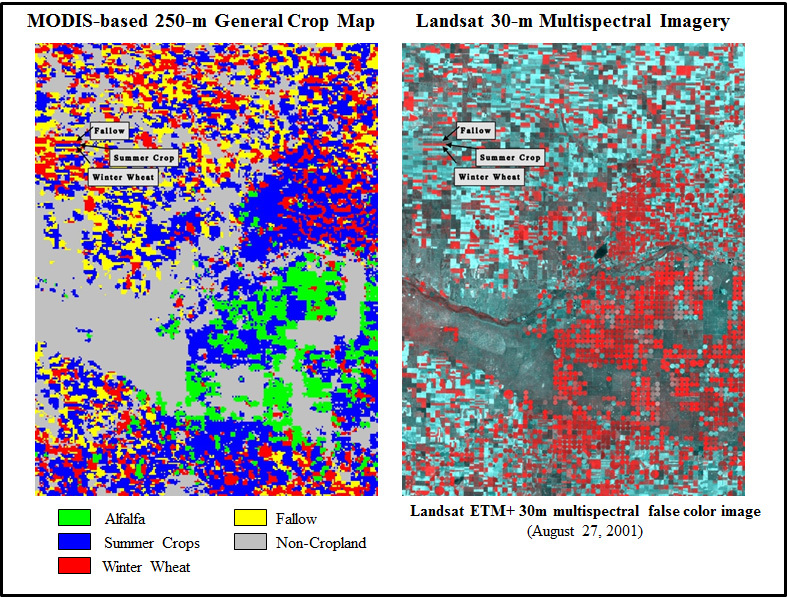 A high-performance and time-lead classification system of field-level crop types using time-series Landsat data and deep learning approach for the U.S. Corn Belt: a case study in Champaign County, Illinois. A high-performance and time-lead classification system of field-level crop types using time-series Landsat data and deep learning approach for the U.S. Corn Belt: a case study in Champaign County, Illinois(210), 35-47. Mariano, D. A., dos Santos, C. C., Wardlow, B., Anderson, M. C., Schiltmeyer, A. V., Tadesse, T., Svoboda, M. (2018). Use of remote sensing indicators to assess effects of drought and human-induced land degradation on ecosystem health in Northeastern Brazil. Remote Sensing of Environment/Elsevier, 213, 129-143. Trnka, M., Hayes, M. J., Jurecka, F., Bartosova, L., Anderson, M., Brazdil, R., Brown, J., Camarero, J., Cudlin, P., Dobrovolny, P., Eitzinger, J., Feng, S., Finnessey, T., Gregoric, G., Havlik, P., Hain, C., Holman, I., Johnson, D., Kersebaum, K., Ljungqvist, F., Lutenbacher, J., Micale, F., Hartl-Meier, C., Mozny, M., Nejedlik, P., Olesen, J., Ruiz-Ramos, M., Rotter, R., Senay, G., Vincente Serrano, S., Svoboda, M., Susnik, A., Tadesse, T., Vizina, A., Wardlow, B., Zalud, Z., Buentgen, U. (2018). Priorities in multidisciplinary drought research. Climate Research, 75, 241-260. Yang, Y., Anderson, M., Gao, F., Suyker, A., Wardlow, B., Hain, C., Otkin, J., Sun, L., Delaney, W. (2018). Field-Scale Mapping of Evaporative Stress Indicators of Crop Yield: an Application over Mead, NE. Field-Scale Mapping of Evaporative Stress Indicators of Crop Yield: an Application over Mead, NE, 210, 387-402. Zeng, L., Wardlow, B., Tadesse, T., Shan, J., Hayes, M. J., Li, D., Xiang, D. (2015). Estimating daily maximum and minimum air temperature using both daytime and nighttime MODIS land surface temperature products over the Corn Belt in US. Remote Sensing, 7, 951-970. Harms, S., T. Tadesse, and B.D. Wardlow, 2014. Improving drought risk modelling: Using multiple periods of satellite data with ensembles of data mining algorithm, International Journal of Society Systems Science, 6 (2):143-158. Harms, S., Tadesse, T., Wardlow, B. (2014). Improving drought risk modeling: using multiple periods of satellite data with ensembles of data mining algorithms. International Journal of Society Systems Science. 6: 143-158. Wardlow, B., Callahan, K. (2014). A Multi-scale Accuracy Assessment of the MODIS-irrigated agriculture data-set (MIrAD) for the State of Nebraska, USA. GIScience & Remote Sensing. 51, 575-592. Trnka, M., Kersenbaum, C., Eitzinger, J., Hayes, M. J., Hlavinka, P., Svoboda, M., Dubrovsky, M., Semeradova, D., Wardlow, B., Pokorny, E., Mozny, M., Wilhite, D., Waltman, W., Zalud, Z. (2013). Consequences of climate change for the soil climate in central Europe and central U.S. Climatic Change. 120: 405-418. Sakamoto, T., Gitelson, A., Wardlow, B., Arkebauer, T., Verma, S., Suyker, A., Sibayama, M. (2012). Application of day and night digital photographs for estimating maize biophysical characteristics. Precision Agriculture. 13, 285-301. Swain, S., D. Rundquist, T. Arkebauer, S. Narumalani, and B. Wardlow. 2012. Non-invasive estimation of relative water content in soybean leaves using infrared thermography, Israel Journal of Plant Sciences 60: 25-36. Albright, T., A. Pidgeon, C. Rittenhouse, M. Clayton, C. Flather, P. Culbert, B. Wardlow, and V. Radeloff, 2009.. Effects of drought on avian community structure. Global Change Biology, In review. Wardlow, B.D., M.J. Hayes, M.D. Svoboda, T. Tadesse, and K.H. Smith, 2009. Sharpening the Focus on Drought � New Monitoring and Assessment Tools at the National Drought Mitigation Center. Earthzine, In press. Gu, Y., E. Hunt, B.D. Wardlow, J.B. Basara, J.F. Brown, and J.P. Verdin, 2008. Evaluation and validation of modis ndvi and ndwi for vegetation drought monitoring using Oklahoma mesonet soil moisture data. Geophysical Research Letters, doi:10.1029/2008GL035772. Integrating GRACE and GRACE Follow On Data into Flood and Drought Forecasts for the Continental U.S.